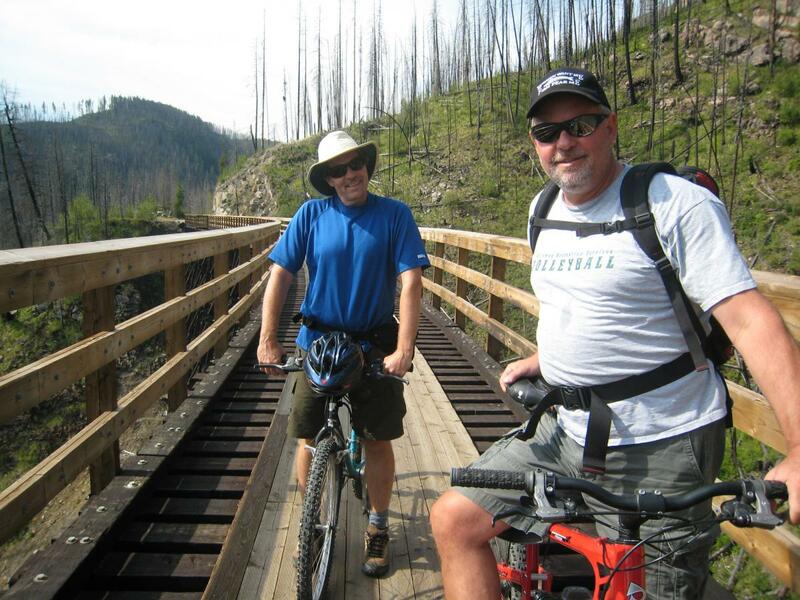 The historic Kettle Valley Railway offers opportunities for cycling. Cyclists are reminded to walk their bikes across the trestles and be courteous to other users on the trail. The lower elevation portion of the protected area between KLO Creek and Bellevue Creek is popular with the local mountain bike club with many trails of varying difficulty. Trails do not meet BC Parks' standards. Bike rentals, concessions and tours are available at the Myra Station parking lot through Myra Canyon Bicycle Rentals, and shuttle services and bicycle/hiking tours are offered with Monashee Adventure Tours. Mountain bikers are asked to yield to hikers and horses. Review: Very interesting ride along trestles, tunnels, but 100% flat and easy. Didn't drop down onto the mountain bike trails. Review: Not for the novice on some of the trails. Loose rock and dirt. Fairly technical drops on some of the single track. Review: Gradual climbs with extensive trail system. Fairly well posted but not with degree of difficulty. Very few riders on these trails and some fairly technical drops. Myra-Bellevue MTB Trail 3.67 out of 5 based on 3 ratings. 3 user reviews.